In today’s world of Ethernet services, why are traditional TDM services still around? Turns out there are some key technical reasons TDM is still in use today. “Business transformation” is all the rage these days, and is often promoted as critical to survival in the modern economic reality. This certainly is the case in the telecoms space as operators, vendors, consultants, and pundits of all shapes and sizes promote their approach to “monetizing”, “modernizing”, or “migrating” some aspect of the network from where it is, to where it should be. (Yes, I’m guilty as charged). But there are some aspects of networking that stubbornly hang around. For example, TDM (Time Division Multiplexing) services have been around since the 80’s, and seem to be going nowhere in a hurry. By “TDM services” we mean any service sold by operators to enterprises large and small, that uses a time-based method to multiplex services over a media, typically copper. Traditionally, the TDM network “carved up” the capacity of the media into time-slots that are dedicated to an individual customer service, whether they’re using their assigned bandwidth or not, thus multiplexing many services onto the network. Typically, this was the way voice services were handled in the not-too-distant past (think pre-VoIP). These services are often referred to as T1/E1, T3/E3, SDH/SONET, and the like. Each had well-known bandwidth capacities, and performance characteristics ideal for voice services. In addition, the time slots could be switched through the network, creating paths from one subscriber to another. Finally, TDM uses some specialized control and monitoring functions to maintain the quality of the service on an end-to-end basis (for example, protection and synchronization mechanisms. 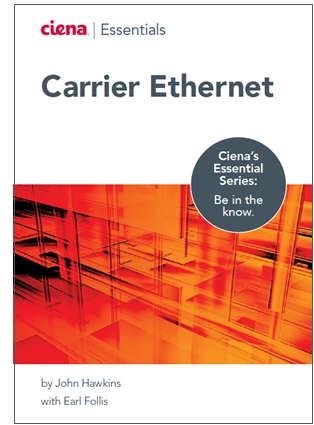 Download our Essentials of Carrier Ethernet eBook to learn more about today’s packet network technology. What are TDM Services? TDM services use a time-based method to multiplex services over a media, typically copper, to “carve up” capacity into time-slots that are dedicated to individual customer services. These services are often referred to as T1/E1, T3/E3, and SDH/SONET. The challenge with TDM has been its relative inability to scale and flex with added and variable demand for today’s data-driven capacity. Operators have been systematically building networks based on packet technologies (specifically Ethernet and IP), that have no concept of a time-slot as did the old TDM networks. These new networks are much more accommodating to the growth and unpredictability of data traffic patterns. Operators can extract significantly more value from their infrastructure (more services, more customers, more capacity) using packet techniques than with traditional TDM. So why are TDM services stubbornly hanging around? As it turns out, there are some key technical reasons TDM is still in use today. Certain characteristics of TDM services are relied upon by end-users in specific industries like utilities, transportation, mobile operators and others. In most cases, those characteristics are not well appreciated. For instance, TDM is still hailed as setting the standard for reliability, and truly, it was engineered to be that way. Most TDM services are capable of being protected, and can react to a failure in milliseconds, protecting the end-user’s application (many don’t even notice when a failure happens). Another such nuance of TDM technology is the availability of accurate timing information inherent in the system. Those time slots we mentioned need to be precisely timed for the system to work. So if needed, the end-user application can simply borrow the clocking that is provided by the TDM system – for example a utility that needs precise timing for power relay activation or a cell site needs precise timing for proper call handoff between coverage areas. But TDM services are expensive to maintain given the age of the infrastructure, are difficult to scale to accommodate new capacity, and have a growing unavailability of qualified operations staff. Besides, operators are investing heavily in packet networks, and would it not make sense if all those TDM services could be accommodated across the packet network? Well it turns out they can. For instance, packet networks have come a long way since their “best-effort” days. MPLS and Carrier Ethernet services today can reach the levels of “five-nines”, and restoration times for even the most stringent SLAs. Precise timing can be carried across the packet network using technologies like SyncE and ITU-T Y.1588v2. Capacity and scale certainly are not a problem as most applications only require moderate to low bandwidth. Today’s packet network is certainly capable of all the technical requirements. Overcoming inertia can still be an issue as end-users are often happy to pay the rising price per bit of the older technology in order to “leave well enough alone.” But those operator challenges remain. So what is an operator to do? TDM-over-packet techniques using moderate cost pluggables in packet platforms such as Ciena’s Packet Networking portfolio allow one possible solution to carry a few services to a network end-point. The end-user receives the traditional TDM handoff with all of the characteristics he knows and loves, while the operator simply “backhauls” the service across the growing packet network. For example, using Ciena’s 3932 platform, a native DS1 port is provided to support up to 16 services in a slightly denser solution, which allows for the best of both worlds to both end-user and operator. Will TDM ever be truly retired from today’s networks? Maybe someday. But transformation can come in various forms, and need not be held back by inertia or technical requirements. Where there is a need there will always be a way, and as the saying goes, old habits die hard. Another key technical reasons TDM is still in use today its low latency. Excellent point Elmo. Low latency it's one of the key reasons utilities and others use it for sure. We've done several installs where Teleprotection applications require very low latency to keep high voltage relays and switches in sync. Using a packet infrastructure engineered with MPLS-TP tunnels (for example) allows us to keep very low latency end-to-end. Other examples exist out there. Perhaps you have one in mind? Feel free to elaborate more! Hi Adrian, thank you for your comments. You make some very good points. I would just say it’s not a matter of one vs the other, but how packets can assist in maintaining the TDM service quality you rightly highlight. Those TDM boxes and the folks qualified to operate them are going away over time. The TDM service is not. For Utility networks, the challenges you highlight are the motivation for Ciena and Schweitzer Engineering Labs (SEL) working together to provide a solution you identify. Ciena and SEL are jointly developing a best of both world solution to deliver Utility TDM services over a packet infrastructure with TDM level SLAs.